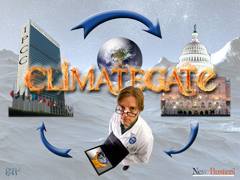 As NewsBusters reported Thursday, the international television news network Russia Today has been doing an outstanding job of reporting the growing ClimateGate scandal. On Wednesday, RT featured an absolute must-see debate between Piers Corbyn, a British weather forecaster and consultant who believes anthropogenic global warming is a dangerous scam, and Aleksey Korkorin, a Russian climatologist and contributor to the United Nations' Intergovernmental Panel on Climate Change. The case [for anthropogenic global warming] is blown to smithereens [by this scandal], and this whole theory should be destroyed and discarded and Copenhagen conference should be closed. The world is cooling and has been cooling for seven years, and the leading scientists, so-called "scientists," have been trying to hide that evidence. The data, real data, over the last one thousand, ten thousand or million years, shows there is no relationship between carbon dioxide and world temperatures or climate extremes. Now we can see that actually the people in charge of data have been fiddling it, and they have been hiding the real decline in world temperatures in an attempt to keep their so called moral high ground. The Copenhagen jamboree is a scandal and it must be stopped. There is a gigantic bandwagon run by governments who want to control world energy supplies and hold back development in the third world. This thing they are doing now is just the same as they are doing in the banking crisis, it is creating a whole bubble of false values. Their claims are false, I repeat, they are false, and this theory they've got is like the Titanic and it will crash. I would suggest that honest green campaigners who want to preserve biodiversity should get off this [man-made global warming] bandwagon before it sinks. Carbon dioxide levels are driven by temps, not the other way around. There have been big peaks in CO2 in past...carbon dioxide is actually a good thing for the world...More CO2 makes plants and animals more efficient. Think you'll see that kind of debate on non-Fox television any time soon?